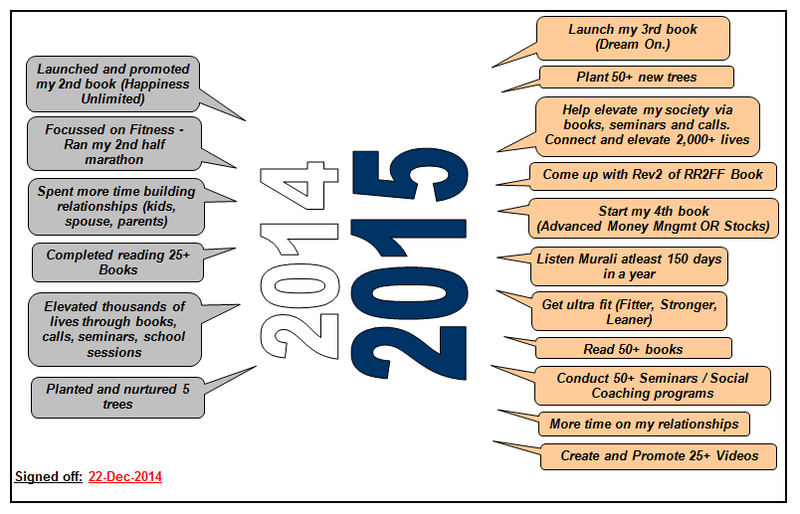 Happiness Unlimited...: Goals Setting for 2015 : 6 Practices that help you achieve more. It is the time of the year, when we have another opportunity to change the way we live our life in 2015. As the saying goes, "Today is the first day for the rest of your life." I present my report card for the goals I set out for 2014, and my goals for 2015. 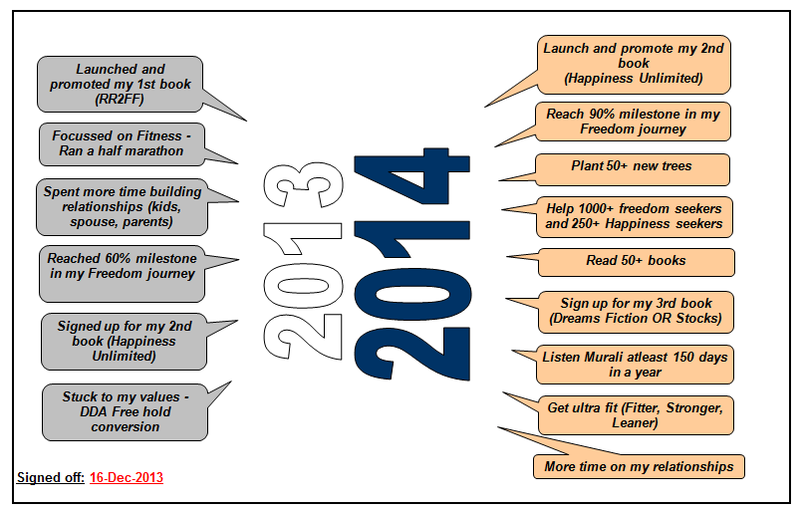 I also present six (6) best practices that help you achieve more of your goals, yer after year. Goal setting is critical and important for us to grow. The fact that our happiness does not depend on achievement of those goals also needs to be very clearly understood. We need not link our happiness to achievement of goals. We can be happy and then go about achieving our goals with our best efforts and intentions. So, here I am with the report card of 2014. Not that I achieved all I set out for, but it was good to have a goal so that I could stretch, come out of my comfort zone and expand myself. And since I was happy during the journey of achievement, a non-achievement or a partial achievement did not destabilize me. Make sure you write your goals down or take a print out. Written goals channelize your mind and allows your mind to generate enough ways to find solutions to achieve those goals. Paste out the goals on a visible location in your home, car or office. Regular viewing helps your mind continue to stay focused and continue to generate new ideas to achieve them. Once the goals are out on your almirah, your family also gets involved in your goals, and that's a very healthy sign. Your children will learn goal setting real time practically happening in front of them, rather than theoretically in a management school. Declare your goals to everyone. Do not be afraid of failing. Wear failure as a badge of honor. You dared to attempt something that hardly 5% in the world do. Keep tracking your goals at a regular frequency every month. Goal setting is just the first step. If you fail to track it, you are unlikely to achieve them. Publish the results from your tracking. Dont be afraid if you are under achieving. 95% of the people are not even tracking it. Prioritize your daily "To Do List" as per the goals you are targeting for the year. Achieving yearly goals is a daily thing. 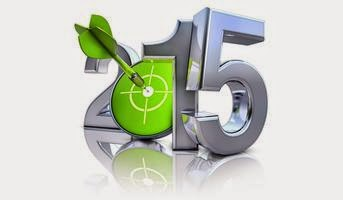 Wish you all a happy goal setting for 2015. Goals should always be aligned to your dreams, which in turn is aligned to the mission of your life. If you need any help in setting up your mission, dreams or goals, you can connect with us. You can also read the chapter on Page 124 ~ Define and Track Your Life Vitals - Mission, Goals and Strategy - in the book "Happiness Unlimited"
Goal setting is your life line. However, never make the mistake of linking your happiness to achievement of goals. Just be happy right now, during the journey and make your best attempt at all your goals.